This is the first in a series of Basic Soloing Guides, for those of us who are wanting to make the leap from run of the mill hunter, to hunter extraordinaire. We'll be going through soloing that isn't quite in the realm of "extreme soloing", but is beyond the grasp of the average WoW player. When I purchased WoD and received my "free" boost last week, I decided it was time for another max level hunter, which means I've been visiting the Timeless Isle again. It's actually been a lot of fun. Delirium (my main) had a five thirty something ilvl when the Timeless Isle first came, so I never had experienced it as a lower geared hunter. Over the last couple of days, I joined a few pugs for rep grinding, and just to get coins, loots and burdens, and several people while in group told me we couldn't do Archiereus, that you needed a raid group to kill him. 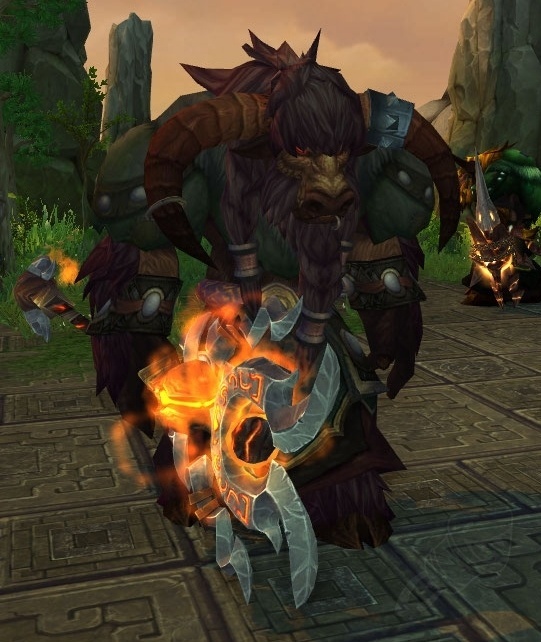 If you're fairly geared at this point, you may find that ridiculous, as he's a bit of a push over for SoO normal or heroic geared players if you just kite him around a bit. But for everyone else, here's the easy-mode way to kill Archiereus. You probably want to spec Survival for this. You can do it as BM, but you'll lose a lot of dps when your pet is kiting Arch away. You want the Spirit Bond talent for this, as well as the misdirect glyph and most likely glyph of mending. (Spirit bond is a clear winner over Iron Hawk because you shouldn't be taking any damage yourself). If that makes too many buttons to press, you could also just macro it into another shot like Arcane or Explosive Shot. You might want an addon that displays your target's cast bar. It's displayed in the Blizzard standard UI, but it's small and out of the way. If you can keep track of it without an addon, then you're good to go. ##Note that these are all things I have anyway, not things I did or got for Arch. If you don't already use all of these things, then now's as good of a time as any to upgrade. Arch only really has two moves you'll be worried about. The cone of fire on the ground, which will one-shot you, and the big magma golems, which will one-shot your pet. The great part is, however, your pet doesn't have to worry about the fire, and the golems are too slow to ever catch your hunter. What you'll want to do, is keep aggro on your pet at all times. You can Misdirect every three seconds, and you'll want to do it pretty much on CD. There's no reason to take any aggro for your self (and it will help so when some other player comes up, they won't have as much of a chance of ripping aggro). You'll also want to keep Mend Pet up constantly. Especially at <=500 ilvl, his melee attacks will hurt your pet. Other than those two things, just fight as normal. Where you'll want to switch things up, is if you see him start to cast conjure golem, you'll hit your petmoveto macro, which will put a little green circle under your mouse so you can get your pet the hell out of there. You'll be moving your pet so she's around 30-40yds from you, and 30-40yrds from where Arch just was. This will keep his Blazing Blow cone from hitting you, and keep your pet well out of the golem's range. You can continue to do this in a little circle. With Mend Pet and Spirit Bond, your pet will never really drop much in health, and you won't have to worry about dodging those pesky fire cones. If someone else comes up and takes aggro (and they will), don't worry about it. Just make sure your pet is higher than you on the aggro table, so when that silly rogue or pally die, you can go right back to what you were doing. Since it can get messy in there, feel free to keep your pet out of the melee pack, then she can start kiting again once she gets aggro back, and you won't have to worry about missing a golem. If your pet dies, you're not in trouble; just don't panic. Remember you should be around 40 yards from arch. So throw up a conc shot, and then hit rez pet, and pet attack. You'll have plenty of time to get your pet attacking, and then feign death so Arch goes back to your pet. I don't use Barrage or Glaives, because you don't want to accidentally pull something else. Especially the lower your ilvl. Just a little extra damage will tip the scales on your pets health pretty quickly. I use a turtle so I can pop shield shell if its health starts to drop. But really any tenacity pet can do the trick. Congrats, now you can head over there whenever you like for your daily chance at that XP boost potion. Nice guide, Delirium. Epecially if your gear isn't 540+ it's a challenge to solo the bigger TI rares, but it just goes to show that with a little strategic pet manouvering, hunters can get a lot done on their own! Rapid Fire, Flaming Shots and Bear Traps, oh my? Should Your Pets Be Rare? Why I don't play the AH, and you can, too.